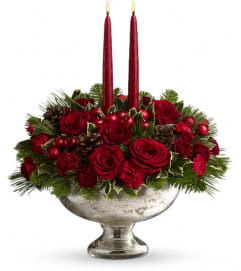 Sweeter than a candy cane, this gift is sure to delight. 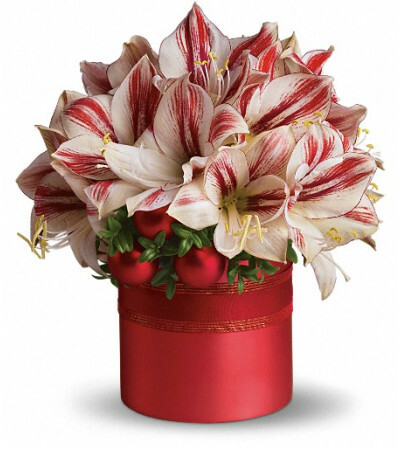 It's amaryllis, the traditional Christmas flower with a beautiful twist. 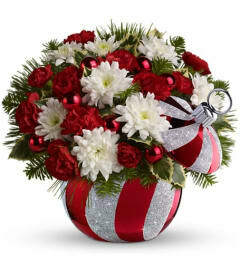 Big, red and white blossoms are arranged with shiny ornament balls and red organza ribbon in a satiny container. Bold peppermint amaryllis, English boxwood, Christmas ornaments, and ribbon come in a red satin cylinder vase. What a tasteful gift!